Need an excuse to eat some ice cream for charity? Here is your chance! 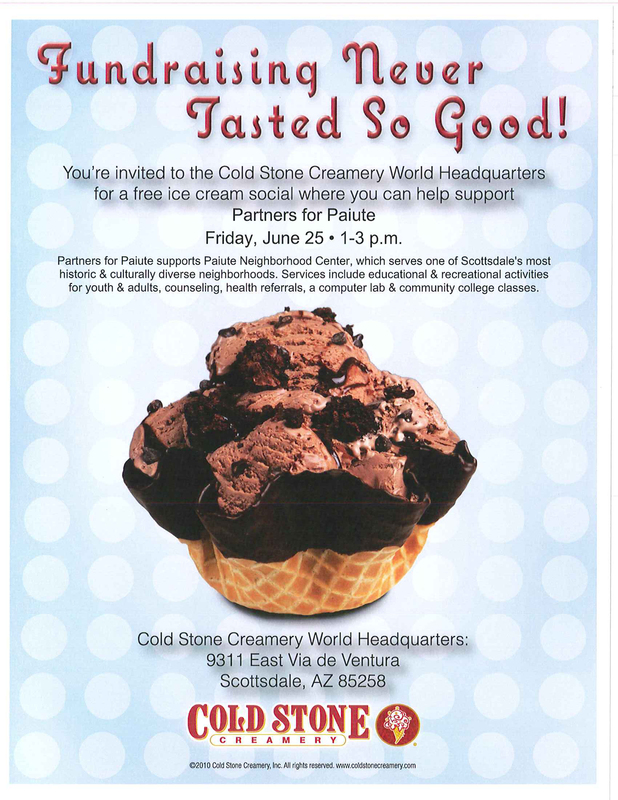 This Friday, June 25 the public is invited to the Cold Stone Creamery World Headquarters for a free ice cream social, with donations requested, to support Partners for Paiute. Partners for Paiute is a non-profit organization incorporated in 1995 to support the on-going development, services, and programs at Paiute Neighborhood Center. They offer a variety of services recreational and educational activities for youth and adults, counseling, health referrals, a computer lab, Scottsdale Community College classes, English/Spanish Classes, early childhood programs, and a senior activity center. The ice cream social will be held on Friday, June 25, from 1 – 3 p.m. at the Cold Stone Creamery Headquarters (9311 East Via de Ventura, Scottsdale).